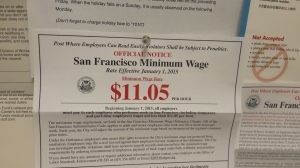 Starting from January 1, 2015, the San Francisco minimum wage increased to $11.05 / hour. This increase reflects the recognition by the authorities of a significantly higher cost of living in the city, driven up by the tech boom, the shortage of housing and the soaring prices for studios and one bedroom apartments. Today, it would not be unusual to see a studio in one of the luxury high rises downtown to rent for $3,000/month and above, and for one-bedroom units to go for $3,500 and above. Because there is sufficient number of high earners in the area who can afford paying this much in rent in order to enjoy the convenience of living downtown and being able to walk to their office, these prices are not expected to go down, in the absence of some kind of unforeseen event, such as unexpected economic slowdown. 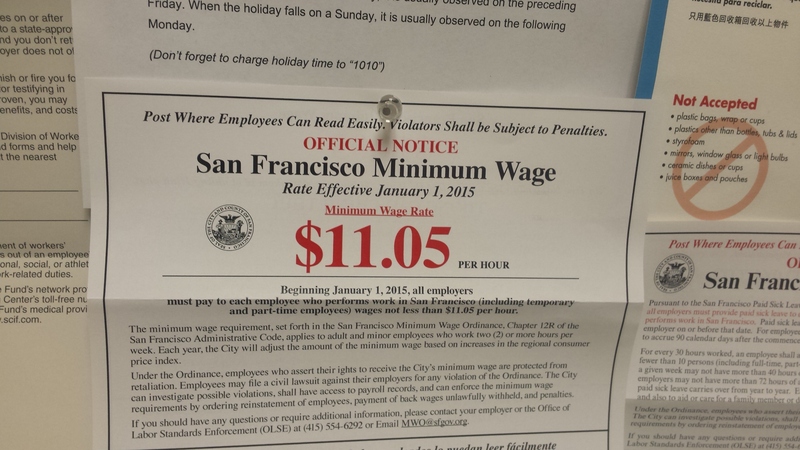 $11.05/hour is certainly not high enough compensation to be able to afford decent housing of any size in any part of San Francisco, but it’s a step in the right direction. Employer have an obligation to have the posting on the image above prominently displayed in the office (typically in the kitchen/rest area) along with other labor / employment posters required to be displayed by law. It would be interesting to see whether the additional of thousands of new units which are under construction now near the Bay Bridge area will affect the housing prices for sale or for rent.